Jalan Puteri ½, Bandar Puteri, Puchong, Selangor. Business hours: 6:30am to 11pm. INDULGE this festive season as Four Points by Sheraton in Puchong offers the best of contemporary Chinese reunion family dinner dishes. Savour delectable items such as the sun-dried oyster dumplings, wok fried tiger prawns and even create your own yee sang. The hotel is offering a special lunar new year menu for private dining as well as a buffet menu at its all-day dining restaurant, The Eatery. Naturally, a reunion dinner would not be complete without yee sang. The Steamed Pearl Tiger Grouper. Toss to the new year with the special Salmon Yee Sang, served with crispy shredded treasures and blackcurrant-plum dressing. Alternatively, choose from the hotel’s five yee sang varieties to take away. Starting from RM65 nett, the salmon, jellyfish, snow shellfish, tuna and vegetarian options are perfect for sharing with family, friends and colleagues. A nine-course lunch menu created from the three set menus available was presented at a media review recently, allowing us to taste the signature dishes from each menu. We started off with the salmon yee sang. 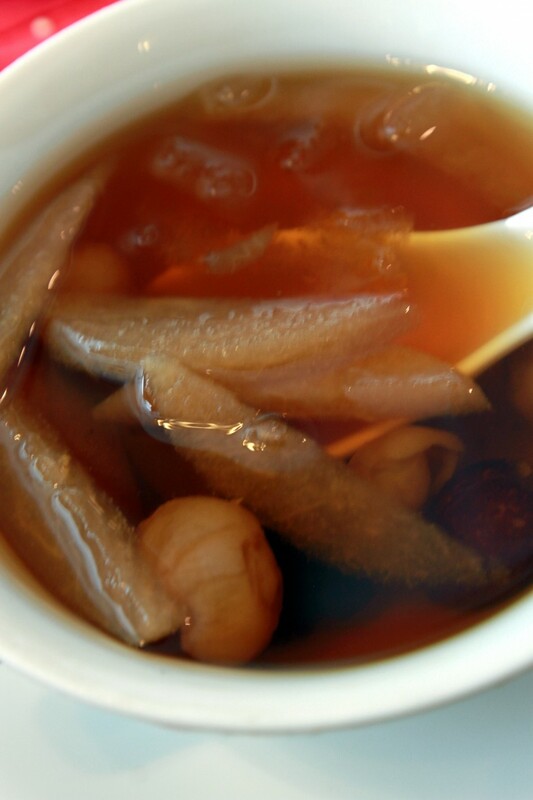 Next came the Double-Boiled Chicken Broth with abalone, dried scallops, bamboo pith and vegetables. The warm broth had a smooth and pleasant taste. For me, the highlight was the Wok Fried Tiger Prawns with chillies and garlic crumb (top pic), which was simply heavenly. A mix of sweet and spicy, the prawns had a rich taste, one that seems to be unique to this hotel. 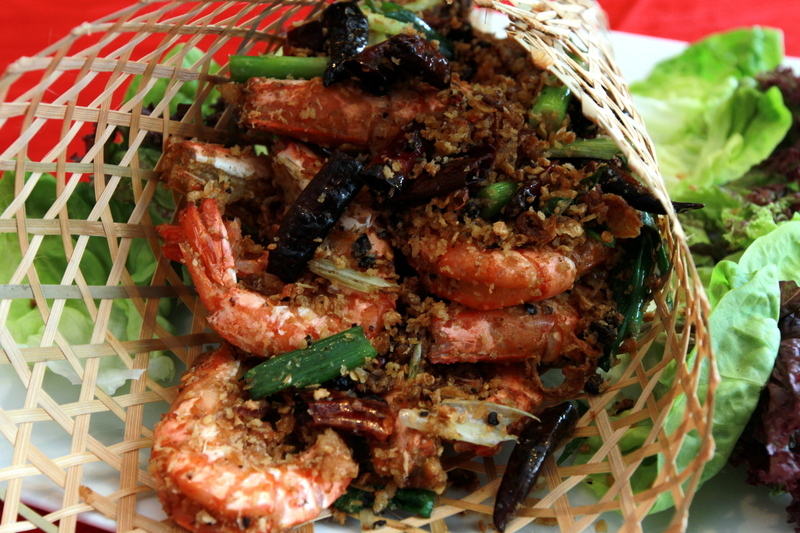 The prawns’ saltiness was hidden by the delicious flavours of spices, giving the dish a sweet aroma. 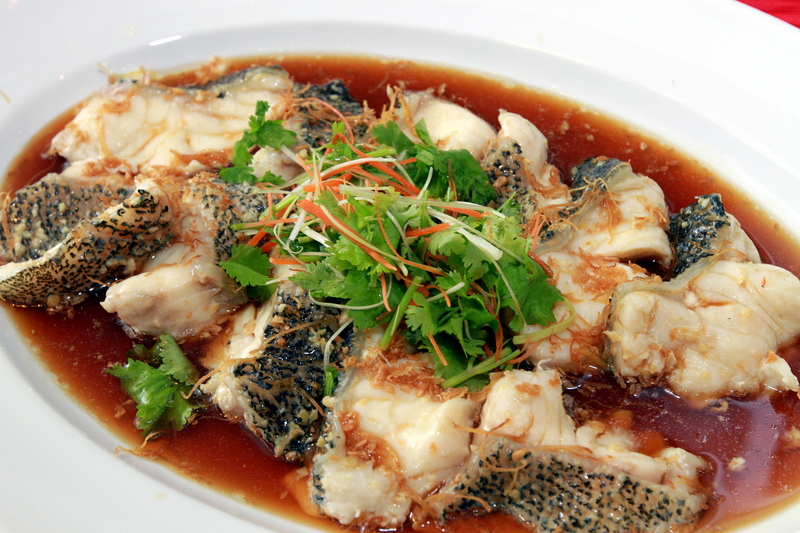 Another dish that deserves mention is the Steamed Pearl Tiger Grouper with golden garlic, julienne ginger and light soy sauce. Packing quite a punch, the fillet’s texture was soft and melted in my mouth. Yap showing some of the CNY signature dishes. 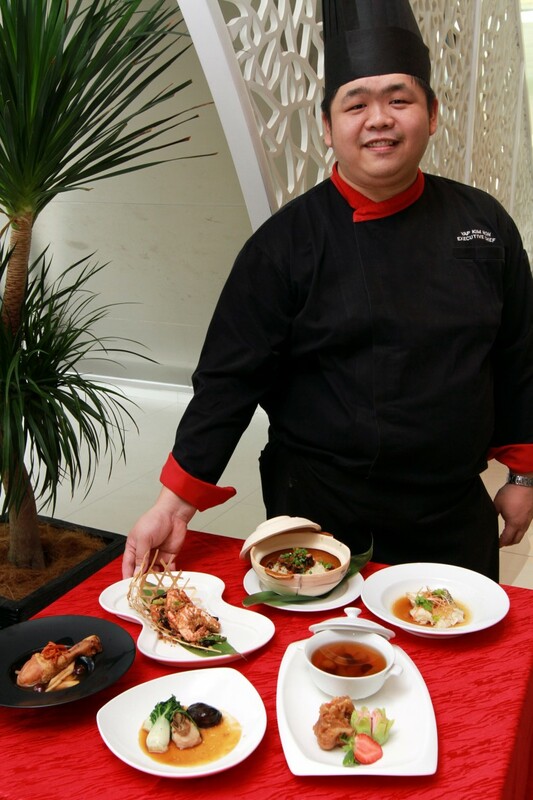 The hotel’s executive chef Yap Kim Hon said this soft texture was obtained by cutting the fish into pieces before cooking. “As a result, the meat is tender as it is cooked thoroughly,” he said, adding that the only other ingredients used in the dish were ginger and some sauce. This is to retain the sweetness of the fish. Yap’s signature dish is the Jasmine Rice Cooked with Chicken Fat, Smoked Duck and Mushrooms. He said the dish was not to be mistaken as fried rice. 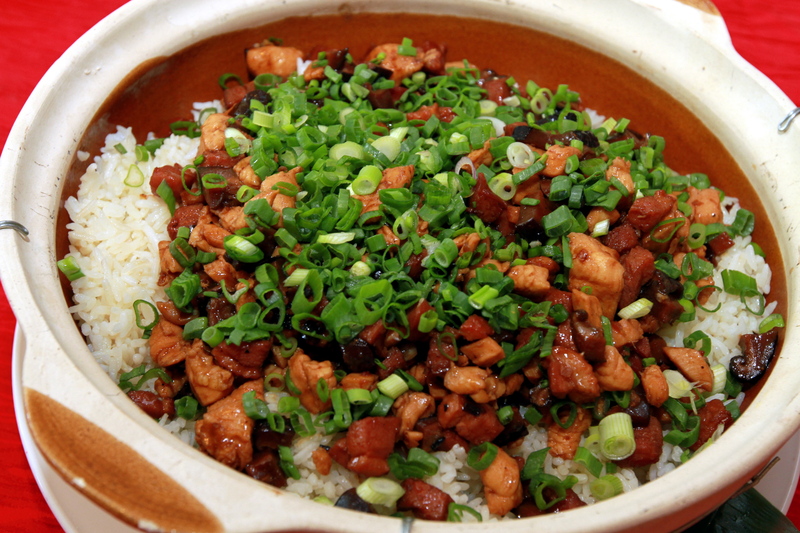 The white rice is served in a claypot and topped with smoked duck and mushrooms. When mixed with the rice, the taste was delightful and certainly unique. There was a tinge of saltiness from the duck, although not too overpowering. For dessert, we had Sweetened chilled pear, dried longan, red dates and rock sugar as well as crispy deep-fried brown sugar cakes layered with sliced yam and sweet potato paired with lotus puffs. 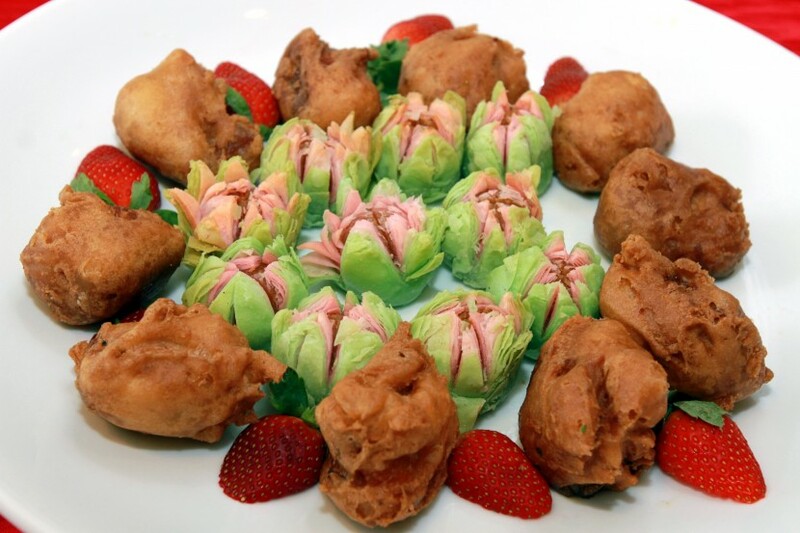 Going with the concept of hot and cold, the desserts captured the essence of the lunar new year. The sugar cakes were crunchy on the outside while smooth and delicate on the inside. Crispy deep-fried brown sugar cakes layered with sliced yam and sweet potato paired with lotus puffs. The banquet menu, which includes delicacies such as Steamed Red Snapper and Double Cooked Farm Chicken, starts from RM1,488 nett per table and requires a minimum booking of three tables. It is available from Feb 8 to 22. The hotel also offers buffet dining on Feb 7 and 8, priced at RM128 nett per adult and RM64 nett per child between the ages of 4 and 12.